On 22 and 23 of June, the Popular University of Anderlecht, in partnership with the Ancienne Belgique, organizes the third edition of the Brussels Popular Festival. The goal is simple : to stop with « Brussels bashing » and to offer a festival 100% popular, 100% participative and eco-responsible. This is also an opportunity to propose a meeting place, a place where communities can open up into the public area. « Let’s blow up the barriers which divide our neighbourhoods and let’s meet each other ! Who said that Brussels was a « Hell hole » ? Not the « Brusseleirs », for sure ! As we know it, Brussels is beautiful with its diversity. This is how we love it ! Let’s honour the richness of its neighbourhoods and its inhabitants ! With the Brussels Popular Festival, the festival organized BY and FOR Brusseleirs, the PUA in partnership with the AB wishes to put an end to the « Brussels bashing ». 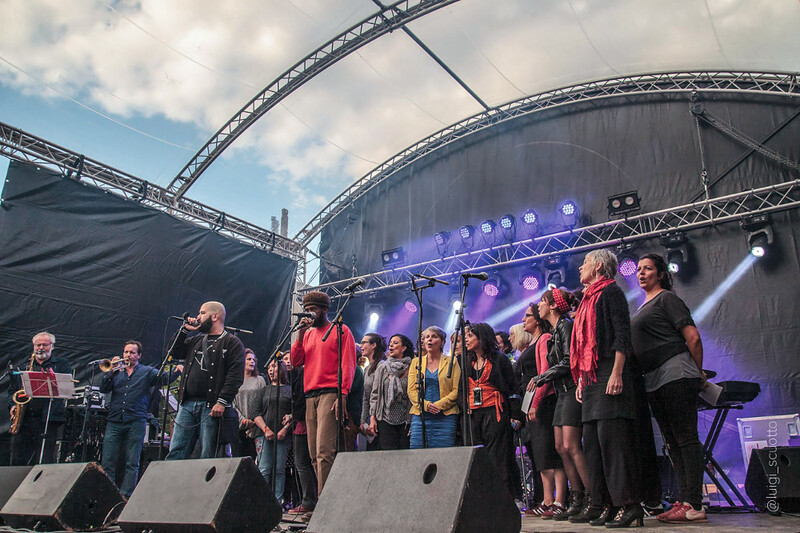 This is a unique experience in Europe : a festival 100% participative, 100% popular and praising eco-responsibility with a special mention to recovery. Our challenge ? To propose a meeting place, a place where communities can open up and where everyone can pay a visit to his/her neighbour to make a human experience, in the heart of the city. Our dream ? To allow the population as well as national and international media to look at the beauty of life in the heart of Brussels neighbourhoods and to expose an image equal to the endless treasures resulting of Brussels diversity. Brussels Popular Festival is also about putting forward the artistical productions by amateurs, professionals or semi-pros from Brussels, and allowing them to join the experience together. This is precisely where Brussels gets its richness from and how it expresses it best. Whether it is the scheduled activities, the stage design and the venue decoration or the promotion, the people from Brussels and elsewhere are invited to participate to the construction of this festival all year round. More than 300 peopleare already involved in the programming, among which about 20 associationsof the « Fédération Wallonie-Bruxelles ». Brussels lacked a place FOR its artists, its inhabitants and BY them. The Brussels Popular Festival is a citizen commitment for diversity but also an opportunity for people from Brussels and elsewhere to take over the public area. For its previous edition, the BPF achieved its goal by gathering nearly 3000 people from various origins in an effort to celebrate, during two days, the popular Brussels, the Brussels of Brusseleirs. We are waiting for you to come even more numerous this year ! Let’s give Brussels the image it deserves, the one we love through its citizens !